Wishing you all health, love and happiness in 2013! I would like to leave you, in 2012, with, alas, not something light, but a reflection that is important to me; the meaning of life. Last winter I took a leave of absence from work to take care of my daughter who was very ill. (She has recovered and is doing very well now!). Since I had quite a bit more time on my hands than I was used to, I ventured somewhat blindly into the Internet world and e-commerce. Anyone who has a business hopes to make money. That’s the bottom line, but it is far too much work for that to be the only motivation. I knew that I wanted to make a difference. I developed a greater knowledge of natural fibers and of the animals and people who produce them. It is this passion that I wanted to share by only selling yarns that were produced by companies that empower the people who make them. 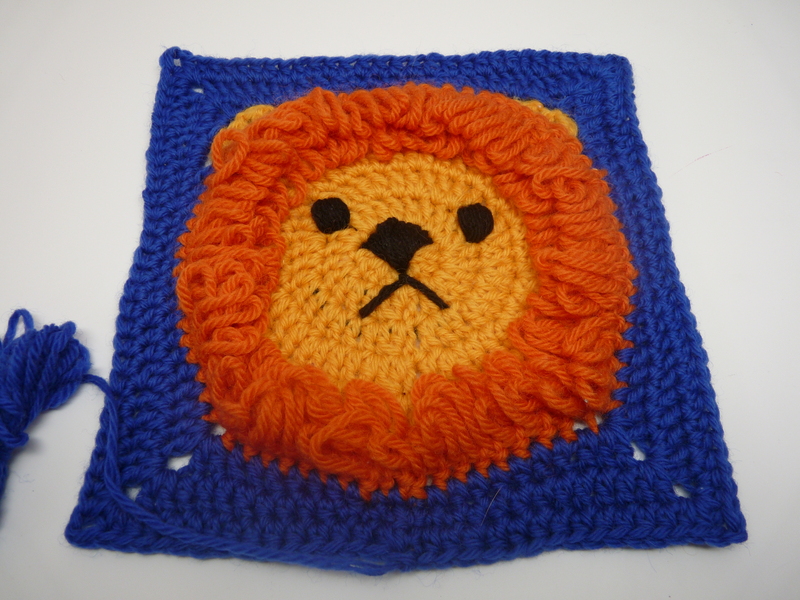 My entrepreneurial efforts have not been fruitful, but during this same period I discovered Knit-a-square and, at the risk of sounding melodramatic, it changed my life. I am a child of the seventies, sensitive to all the social injustice that was brought to our attention. With all the unadulterated optimism and passion that only a teenager can have, I signed petitions, attend rallies, boycotted companies American and foreign. Until I reached my twenties, I was extremely proud of my “activism” and felt I really was making a difference. We all have these memories. These moments in time that are frozen in our minds. Their meaning? We can brush this memory aside as simple coincidence, but it then becomes persistent, nudging, nagging we must eventually consider it’s significance. I was twenty years old and I had just seen the movie Gandhi with some friends. I don’t remember much of the movie and I haven’t seen it since. What I remember is sitting in my parent’s kitchen with my mother and one of her friends, explaining the film to them, the man to them, with tears streaming down my face. “What was I doing with my life?” “Wasn’t that what Gandhi was asking us?” Life is not just for living, but for making life better for those around us. I was faced for the first time with the adult reality that perhaps it wasn’t enough. Perhaps I couldn’t make a difference. My mother and her friend listened patiently to what they assumed was a sort of late adolescent existential moment, but I knew it was more. I went on to finish college, start a career, get married and have children. The desire for this path was irrefutable. In another life I might have joined the Peace Corps or another organisation, but I knew my place was here. I have an extraordinary husband and four beautiful children. I put all my energy into raising them and my teaching. With this, different volunteer activities and the monetary donations I could make, I knew I was making a difference. I had no doubts that I was being true to my values, caring for others, making life better for those around me. The memory only appeared at the worst of moments, as that kind of memory is want to do, Chile, Argentina, Bosnia, Rwanda, Afghanistan, Iraq. I am a doer. I can’t just sit and watch. I would rather have someone tell me that they don’t want my help than not offer it at all. Don’t tell me there is nothing I can do. I refuse to believe it. So does Ronda. Ronda explains that she could no longer sleep at night after passing these poor children in the streets day after day. She could no longer believe that the situation was hopeless. She had to do something. What she and her niece Sandy decided to do is the most extraordinary thing. Forget the big picture. What can we do, small, easy, cost-effective? 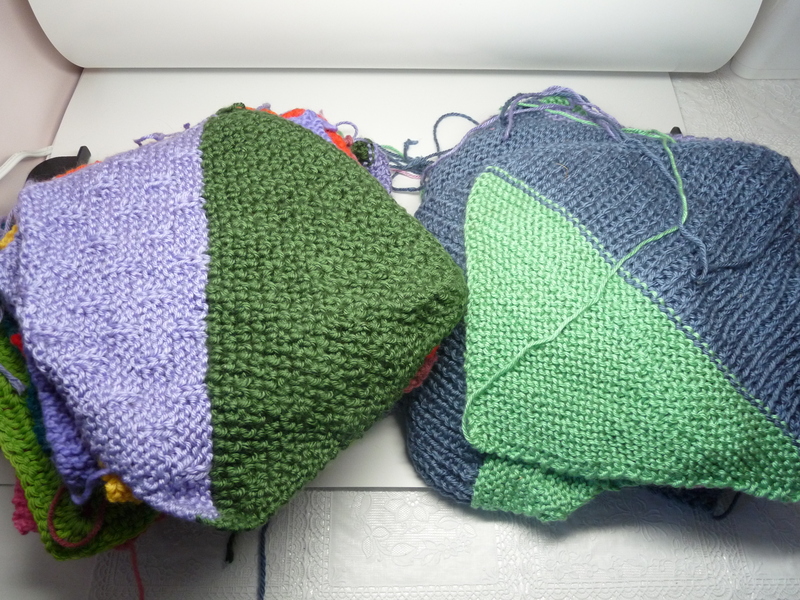 Knit-a-Square is born. 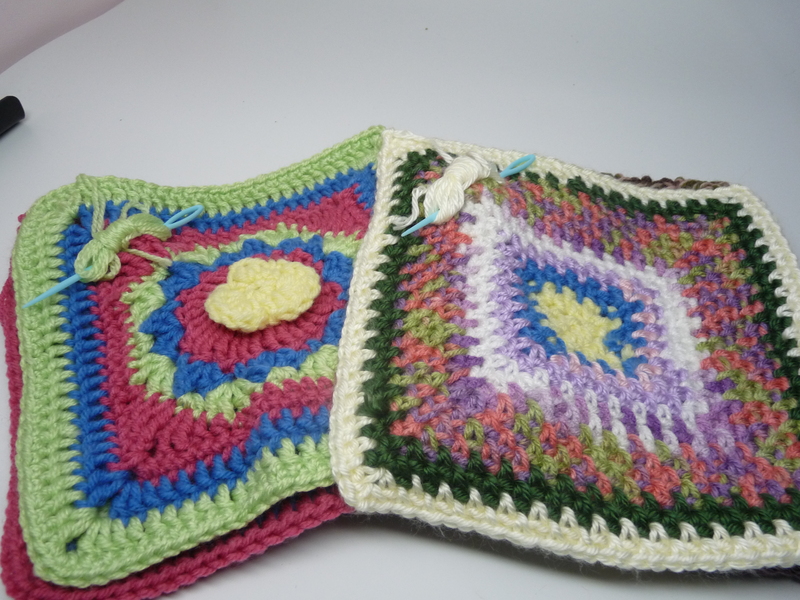 One square at a time we will provide warmth and comfort to the aids orphans of South Africa. I will be eternally grateful to Ronda, Sandy and the rest of the family members for what they are doing for the children and for what they have done for me. This is the moment my memory illuminates my 49-year-old mind. THIS is what I have been searching for. My way to truly make a concrete difference. I cannot stop war or violence or disease, but I can knit. 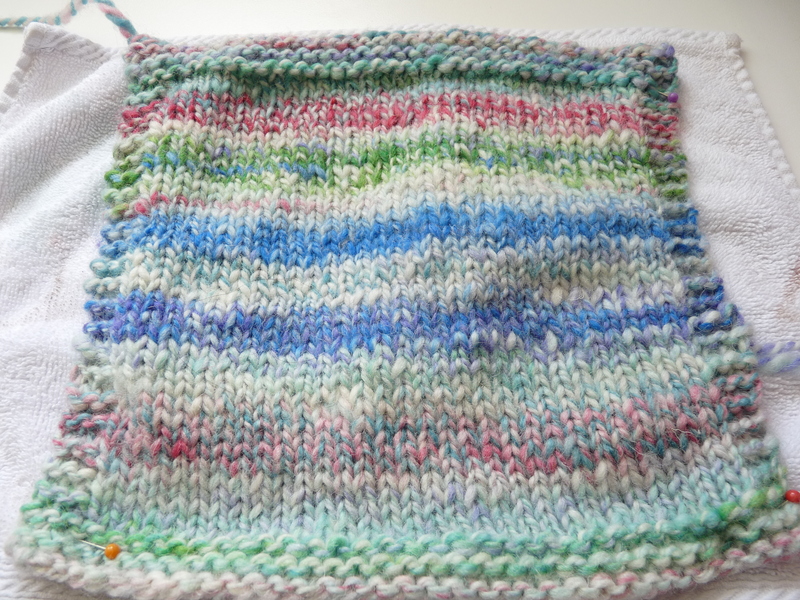 Squares knit by my hands will be wrapped around the shoulders of a child to keep him warm and to give him strength, strength to know he is not alone that people all over the world want him to grow and thrive and have a happy life. 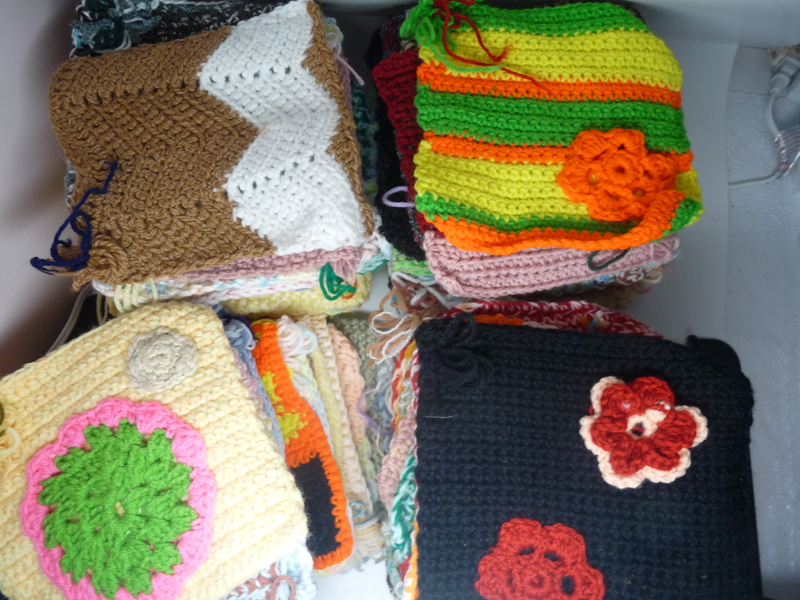 I cannot physically wrap my blankets around these children, but this is my wish that is sent with each square. This is my legacy, the one my parents left me and the one I have worked on and finally made real to leave for others. What is living? Another year is coming to an end. For me, it was a year of trials, but also joy. Gratefully, I retain more of the memories of joy than the scars of trial, thanks in many ways to all of you! Please know that all all your fantastic creations have been received and are being sent a few packages at a time. They will all reach South Africa before winter 2013 arrives. If you join the KAS forum, you will be able to see photos of your squares and of all the extraordinary work of KASers from all around the world along with other wonderful information. I leave you with the latest KAS video where you can see and hear the children we are striving to help, one square at a time. The plight of Southern Africa’s aids orphans is heart breaking and depressing when we stop at awareness. When we take the next step, action, like the McDonald family, the heartbreak is still there, but the depression turns to joy. When we realize that we, as individuals, can help and that there are so many extraordinary people willing to join in, it fills me with hope for the children and renews my faith in human beings. I have received several packages in the last few weeks. Every time one arrives, it feels like Christmas! I never cease to be amazed at your generosity, but also your incredible talent. All the articles I receive are absolutely beautiful, as you can see! 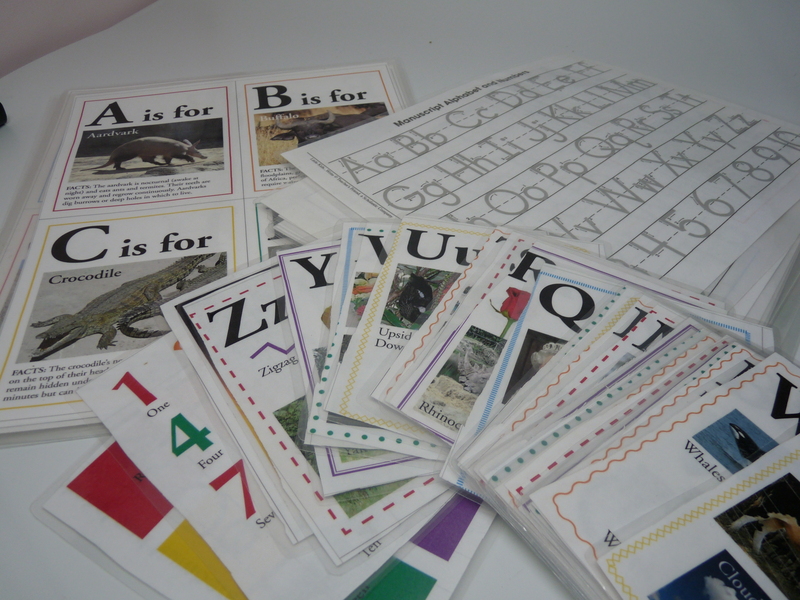 Rachel sent 5 squares, 1 gorgeous, thick, Kascuddle, 2 hats for Kareemah, two other hats, 1 pair of socks, and these fabulous laminated books. Squares are the main focus of KAS, but many other items are appreciated. You can see the current wish list here. Mary and Joan are an extraordinary mother-daughter team who sent me three boxes chock-full of 118 beautiful crocheted squares. From Mary, Joan and Lisa. 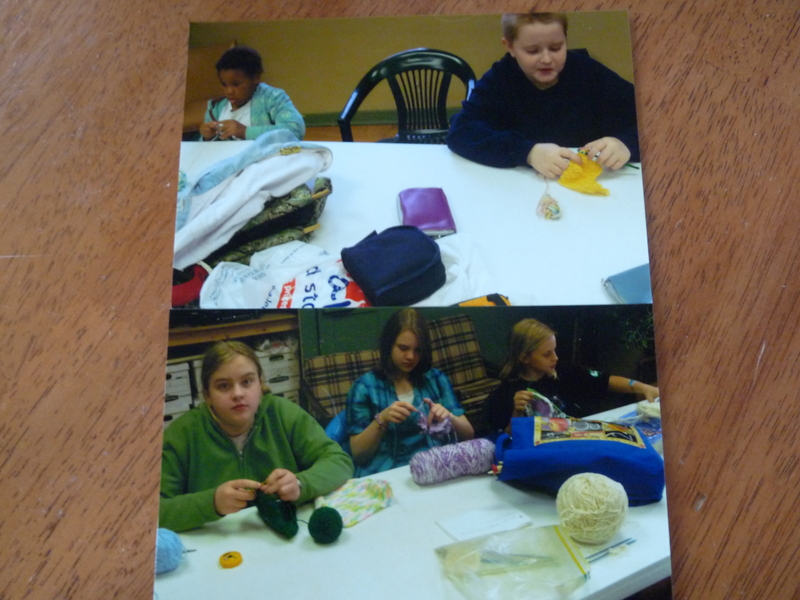 Kristal is a young woman who started a group to teach children to knit. They sent us 25 lovely squares. Lisa sent 37 gorgeous squares. That’s more than one whole blanket! My mix up! Mary, Joan, Kristal and Lisa. I apologize to Mary, Joan and Lisa. Your squares got mixed up before I got my pictures taken. I hope you see your squares here. I have them all. Don’t worry. I just didn’t remember which ones belonged to whom! Marcie, who is the proud owner of 5 cats like me (it’s nice to know I’m not alone! 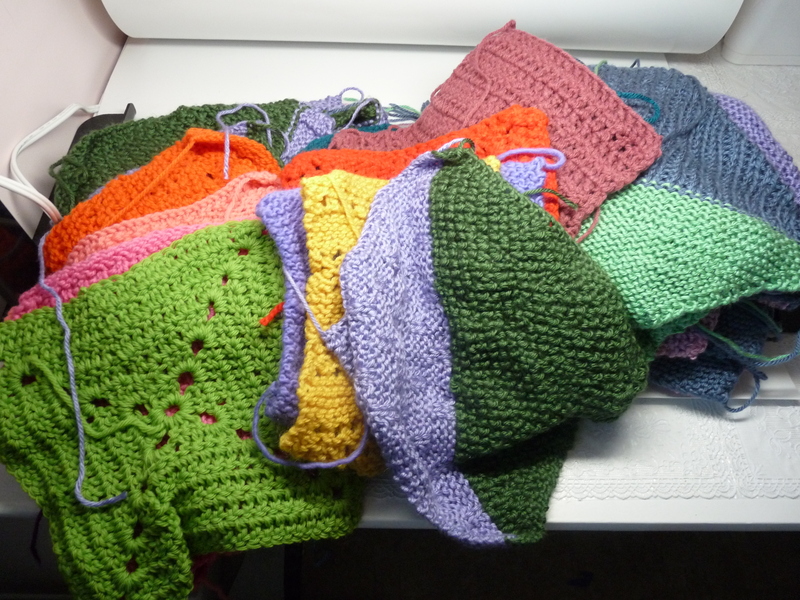 ), sent 33 squares, 3 hats and one go-over. They are all just beautiful! We are well on our way! You can find out more about this challenge here. Everyone who contributes will receive coupons from my yarn shop Hands with Hearts as a token of my appreciation. 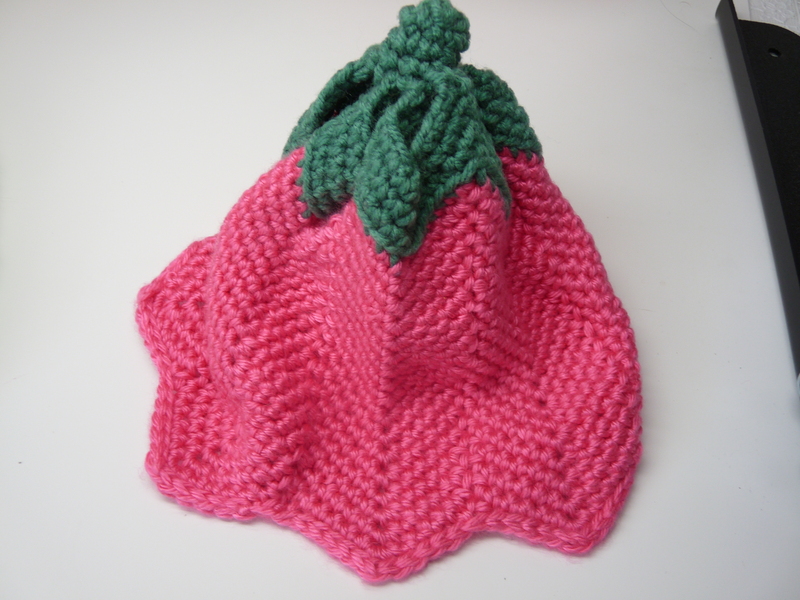 If you don’t knit or crochet, you can still help! Please spread the word. Talk about KAS at work, school, in your religious and other community groups. One of the most important things we can do is to get more people involved. Please “Like” the KAS Facebook page! I made the decision to open my own online yarn shop, Hands with Hearts, for one reason. I want to make a difference. I want to offer people the most beautiful natural yarns for their fiber creations that also give back. You don’t even have to make a conscious decision. You have my promise that anything you buy in my shop supports one or several causes: empowering people in developing countries, teaching trades, providing livelihood, supporting health and education, supporting proper treatment of animals, protecting endangered species, supporting environmental practices in fiber development, supporting small farmers and other small artisans. I want to introduce you to four of the companies that I support by offering their products in my shop. I encourage you to read more about them and to consider using their products in your future projects. They have all given me the inspiration and the motivation to join the world of online retailing. Manos del Uruguay is a cooperative begun by five women in 1968. They offer training in dying and spinning, weaving and knitting fiber. They also teach women business skills. Each cooperative is individually owned. Since their creation, Manos has changed the lives of generations of families in Uruguay, providing health insurance, retirement pensions, paid vacations and paid maternity leave for their members. The company has recently been admitted into the World Fair Trade Organisation. You can read more about the history of the company here. They make extraordinarily beautiful kettle-dyed yarns. Be Sweet is a company with a conscience. Founded in South Africa by the American Nadine Curtis, Be Sweet trains and provides jobs for women in the poorest regions of South Africa. They also give back by supporting education programs. Read about these programs here. Be Sweet is most known their amazing hand spun mohair yarns, but they also have gorgeous organic cotton, bamboo, merino and recycled yarns. Green Mountain Spinnery is also a worker owned cooperative. Located in Putney Vermont, The Spinnery embodies all the values of a company that I want to work with. Their goals, as you can read here, are to create yarns of the highest quality, to help sustain regional sheep farming, and to develop environmentally sound ways to process natural fibers. They make every effort to purchase directly from individual growers. Their 100% wool yarns are spun entirely from New England fleece. Unlike most commercial mills, The Green Mountain Spinnery uses no chemicals to bleach, moth-proof or shrink-proof yarns. Their yarns are the “real deal,” beautiful, natural, socially and environmentally sound. Snow Leopard Trust has been working for over 25 years to save the endangered snow leopards of Asia. The most wonderful aspect of this organisation is that they have studied to understand the causes of the conflicts between people and the cats. They have developed programs to train the nomad Peoples of Mongolia, for example to dye and spin beautiful camel-hair fiber. 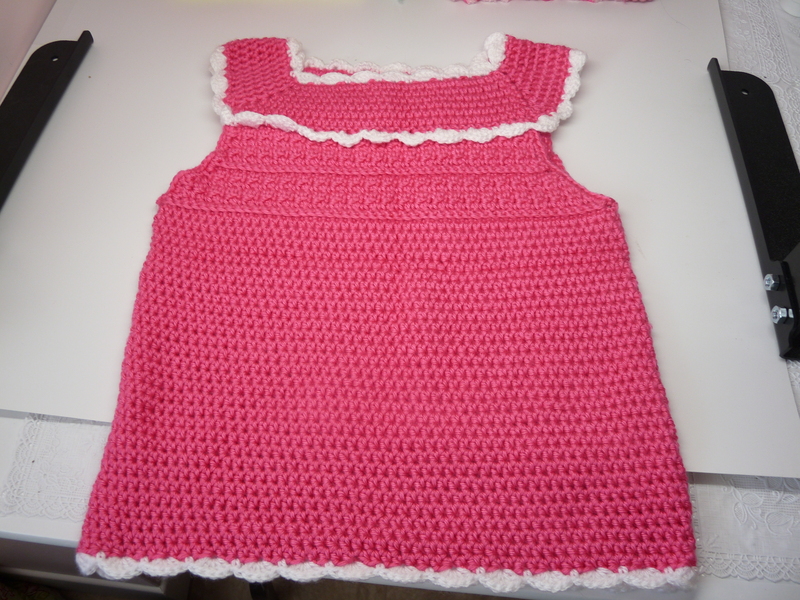 They also felt wool into clothing and toys. These new sources of revenue along with education about the snow leopards has reduced poaching and the killing of the cats for food. I leave you today with a short video of these beautiful animals. 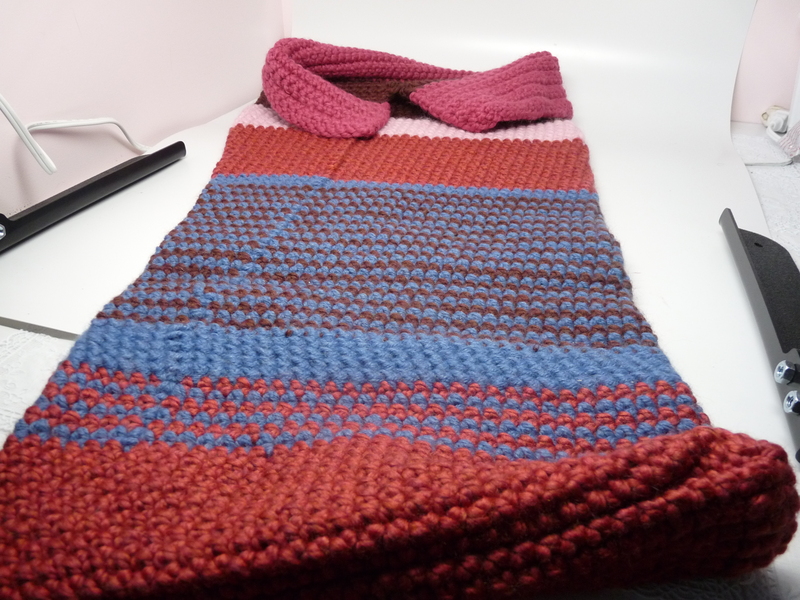 In my welcoming blog post last week, I announced a new Knit-a-Square challenge. 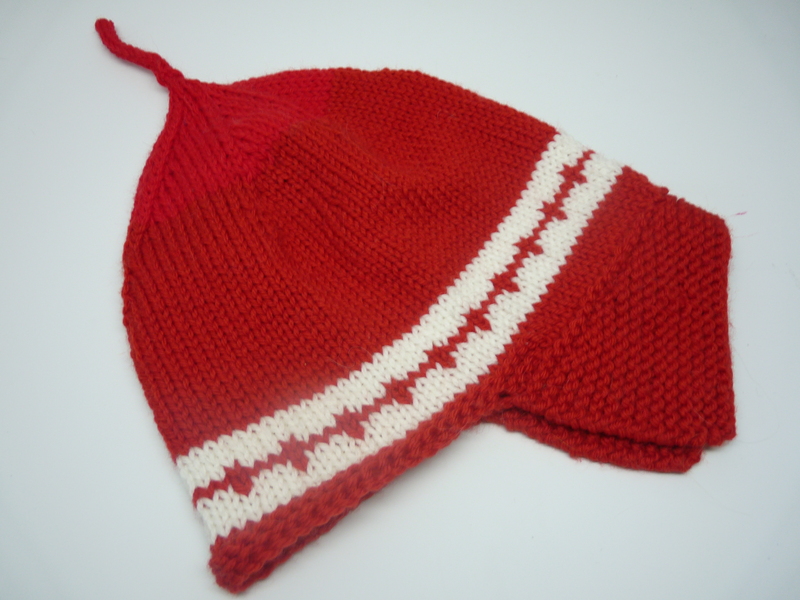 I’m asking you, your family, friends and co-workers to help me raise 100 red and white hats and 700 squares by October 1st. And you have already responded! 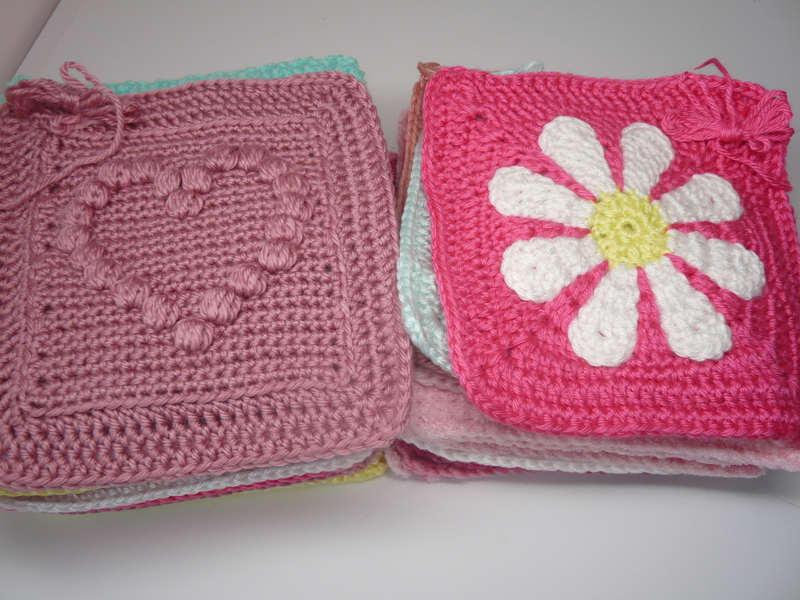 I received a box from Maggie with 45 gorgeous squares and 6 pairs of socks. Look at the amazing creations. Isn’t the lion adorable?! Thank you so much, Maggie!! I made one square from hand dyed, hand spun Shetland wool made by a lovely woman in Edinburg. Her Etsy shop is called Little Theorem. 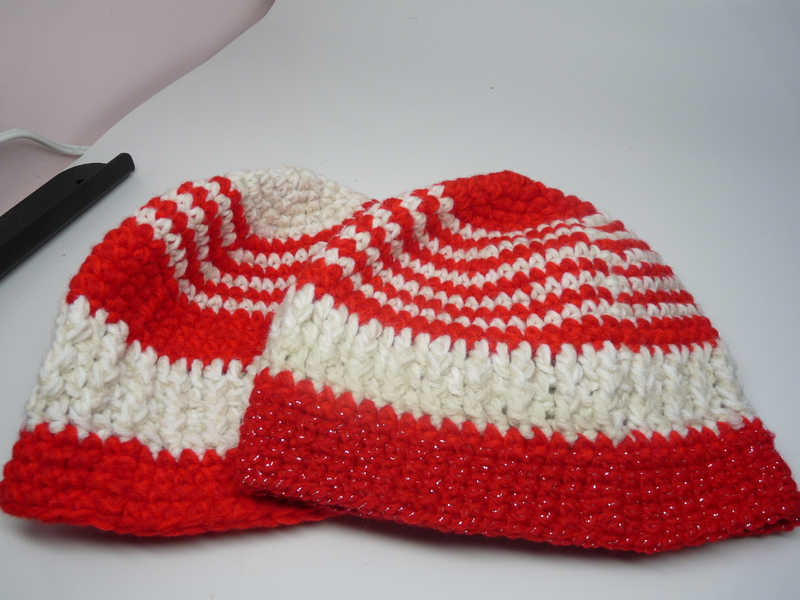 I also made one red and white hat for Kareemah’s kids. So, one week into our challenge and we have 46 squares, 6 pairs of socks and 1 hat. Fantastic!! Now, I know that most of you reading this are like me, living in the northern hemisphere. We just marked the beginning of summer and here in Canada we have been having a heat wave. I have to remind you that in South Africa the situation is the opposite. Winter has just begun in South Africa and they are expecting it to be quite harsh. I know that when we think of Africa we imagine the Sahara and lions on the plain, but that is only part of Africa. South African winters are cold, rainy and snowy, with freezing temperatures at night. I have made the point before that children need blankets for security, not just warmth. In the case of our aids orphans they need both! So please join us! 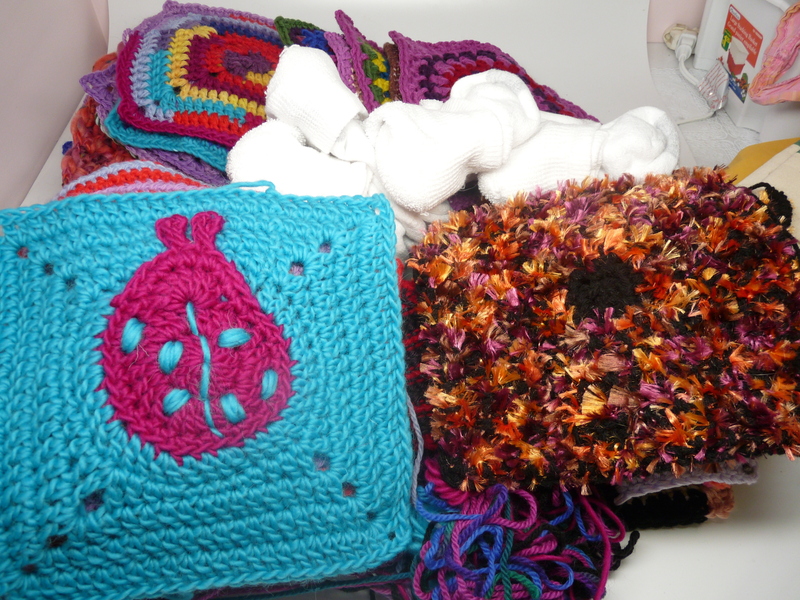 Squares are the main focus of KAS because they are easy for us to make and inexpensive to send, but other items are welcome: hats, socks, sweaters, underwear, stuffed toys, pencils, paper and more. See the details here. Thank you so much and don’t forget to “Like” the KAS Facebook page!